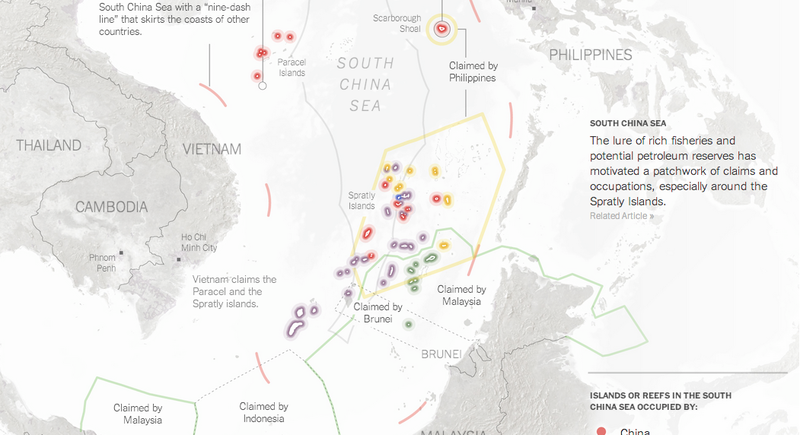 Over the last few weeks, tensions have been rising in the South China Sea. While most of the world has been focused on violence in Ukraine and Nigeria, fishing boats and other maritime vessels in the South China Sea have been clashing—thankfully without the use of guns or missiles. These clashes contribute to a growing fear that one day, one clash will spiral out of control and lead to something more than required paint jobs for fishing trawlers. Thankfully, for those of you unfamiliar with who exactly owns what and what they think they own versus what they think others own—in short a mapped out version of the conflict—the New York Times has put together a nice map. Hong Kong—and to a similar extent Macau—is part of China, but at times not so much. Because of the long history of British control through their colony, the people of Hong Kong, Hongkongers, are accustomed to a more liberal, democratic, and perhaps Western lifestyle than those of mainland China. Since the British handover, a local university has been asking the inevitable question of “Are you Hongkonger or Chinese?”. 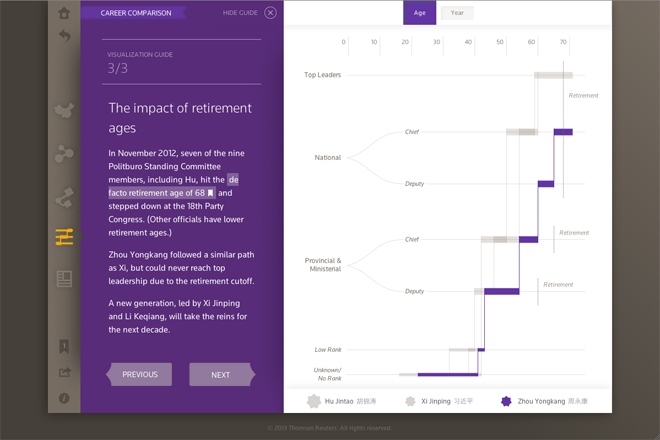 This interactive piece from the South China Morning Post looks at how that answer has evolved over nearly 20 years. The piece presents a broad overview on the right with the specific survey results displayed larger on the left. Broadly speaking, the piece is successful. In particular, the decision to highlight the particular survey on the right brings that into focus without losing the context of the historical results. And providing a timeline beneath the larger stacked bar chart on the left offers a second means of choosing a survey of interest. Yet I think the piece lacks two, perhaps three, elements that would improve the piece. First, sometimes I like to see the numbers for data visualisations. Adding a hover or mouseover state would help with that. Second, while the chart on the left includes a 50% line, I wonder if that would not also be helpful in the historical display on the right. Thirdly, and perhaps not too important for those not terribly interested in the data, the overall piece states the sample size for all surveys being within a range. People wanting more data on the survey responses might be interested in seeing the sample size per survey. Credit for the piece goes to Simon Scarr and Joe Lo. China is a big country, both geographically and demographically. It can also be rather opaque and difficult for an outsider to understand. 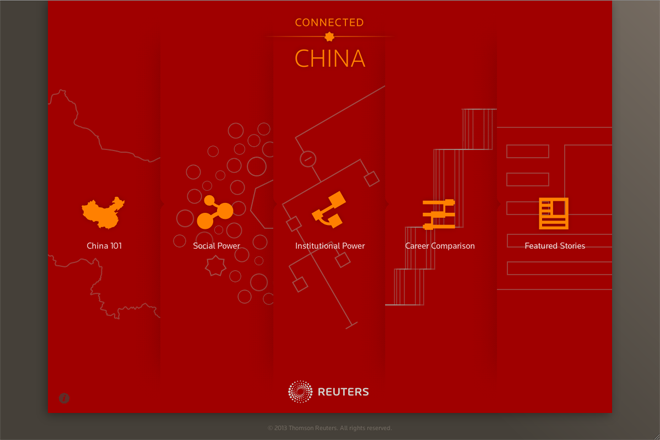 So this recent work from Reuters is amazing because it makes China a bit more transparent while illustrating just how the political system structures power and personnel appointments. Truthfully, there is more content there than ought to be consolidated into a single blog post here. Briefly, the project was some 18 months in development and hits upon three key areas: Social Power, Institutional Power, and Career Comparisons. Two other sections, China 101 and Featured Stories, offer additional material to help the user understand China’s past and what is going on in the present. Social Power examines, primarily through the use of network diagrams, the social dynamics of the upper echelons of the Chinese leadership. Previous generations of Chinese political leaders saw power confined into the hands of a few, e.g. Mao Tse-tung, but in recent years the Chinese Communist Power has decentralised that power into several individuals. Many of those individuals have friendships, marriages, and business relationships that have advanced them and kept them in power. The interactivity allows the user to dive deep into these relationships. And should things becoming confusing, here and throughout the app, there are links to biographies, definitions, and guides to explain what is before the user. Institutional Power roughly compares to a look at the American system of checks and balances. The responsibility of governing China falls to three “branches”: the Communist Party, the Chinese government, and the People’s Liberation Army (under which the navy and air force fall, e.g. the People’s Liberation Army Navy). 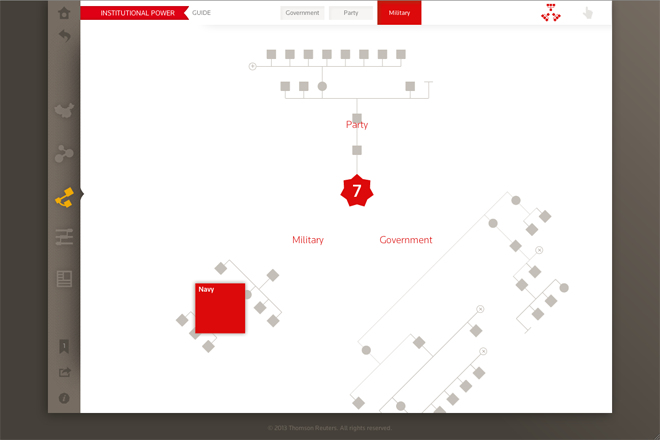 This section of the app lists who belongs to each post or group and how that post or group falls into the broader structure of the Party, Government, or PLA. 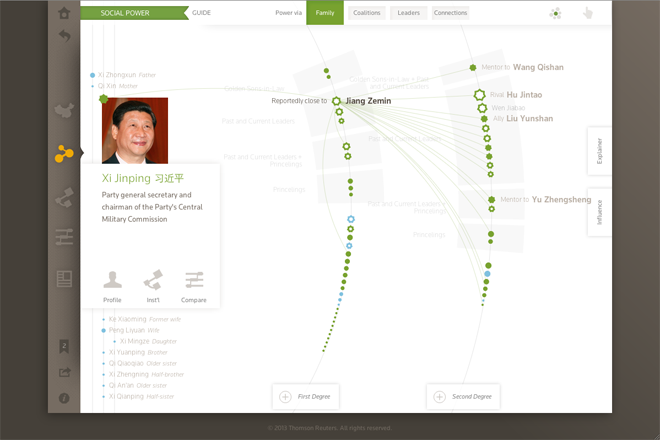 The Career Comparison shows the different—but not really—tracks taken by the leaders of China. The user can compare individuals both present and past, along with potential future players, to see their route to power. China’s political system, because of its arguably undemocratic nature, is different from that of the United States. 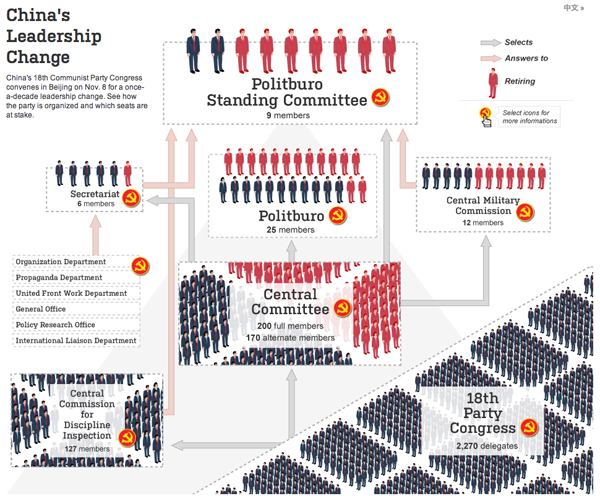 The path to power is longer and more established in China, as this section clearly shows. The United States is not the only country in the world to have an election this November. It isn’t even the only big country. China is/had elections to replace the top leadership in Beijing. That’s right, it’s that about that time once every ten years when the Chinese political leadership is replaced. The Wall Street Journal had a nice interactive piece introduced with an animated video explaining just how the Chinese political system works. Or at least how we think it works. It’s not an entirely transparent system. Though as Americans have discovered lately, the transparency in seeing how large pieces of legislation are conceived, written, and passed is not necessarily a good thing. Along with the diagram of the system, the piece offers photos and brief biographies for the presumed front runners. The “winners” of the elections should be announced sometime Thursday. Along with the new leaders, the Communist Party may also reduce the Politburo Standing Committee from nine members to seven members for more efficient governing. But nobody knows. We’ll see Thursday.